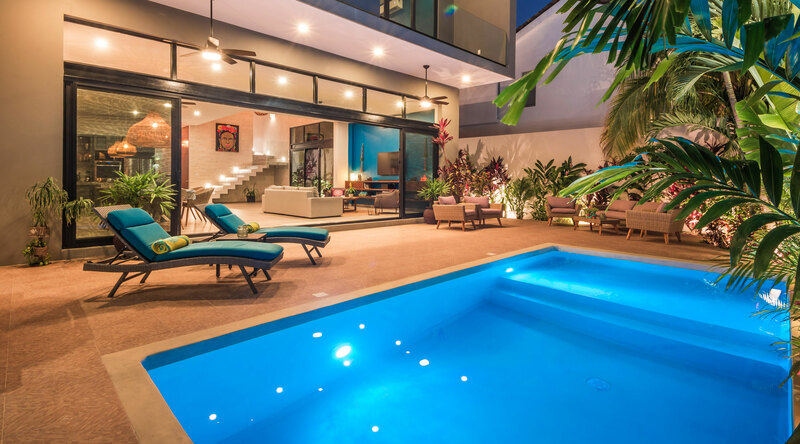 The lush and spacious Casa Lulu is a tropical sanctuary home away from home. This 4 bedroom, 3 bathroom villa is one of our newest additions, located in the upscale residential area of Aldea Zama in Tulum. Aldea Zama is centrally-located, nestled in between the Tulum’s beach hotspot and Tulum’s town, affectionately known as Tulum Pueblo. In town you’ll find cute little streets lined with lovely local bars and restaurants, cafes, artisan arts and crafts, and souvenir stores. Tulum’s beach hotspot is a lush tropical road through paradise filled with amazing restaurants, beach clubs, boutique shops and more. This magical location offers the perfect fusion of sea, sand, natural attractions, and activity to delight every sense. Casa Lulu’s gorgeous first floor layout brilliantly connects the indoor and outdoor worlds with a full panoramic glass sliding wall. Designed to breathe in tropical living and feel immersed a spa retreat-like setting. With loads of natural light and its strategic design, Casa Lulu allows you to be one with nature while at the same time experience the ultimate in comfort. The modern amenities of Casa Lulu ensures your stay here will be met with everything you could imagine for a lavish getaway in paradise. The open concept and flow of Casa Lulu’s main living area is designed to be multifunctional and easily interchangeable. This large space can be used as a dining area or transposed to allow for entertaining or to create your own yoga studio or soothing massage room. The light that enters and the high ceilings give you a great sense of openness as limitless as the stars in the sky! Casa Lulu spares no expense when it comes to kitchen space. Experience a true modern day chef’s kitchen, designed with the intention to prepare gorgeous meals at home or for a personal chef to come to prepare a special meal for a soirée or group event. All of the bedrooms at Casa Lulu have been designed to have its own unique look and feel. The master bedroom has been designed to be very zen-like with modern organic finishes. It includes and incredible stand-alone bath tub inside the home which is a very unique feature in Tulum. The other bedrooms incorporate modern clean lines and beautiful finishes. Modern comforts and amenities, peace, and serenity all await you at the beautifully designed Casa Lulu, Tulum.